While everyone has heard of fondue, cheese is a standout in many other Swiss foods from the region, too, including this Älplermagronen mit ankestückli, or Alpine macaroni with applesauce. 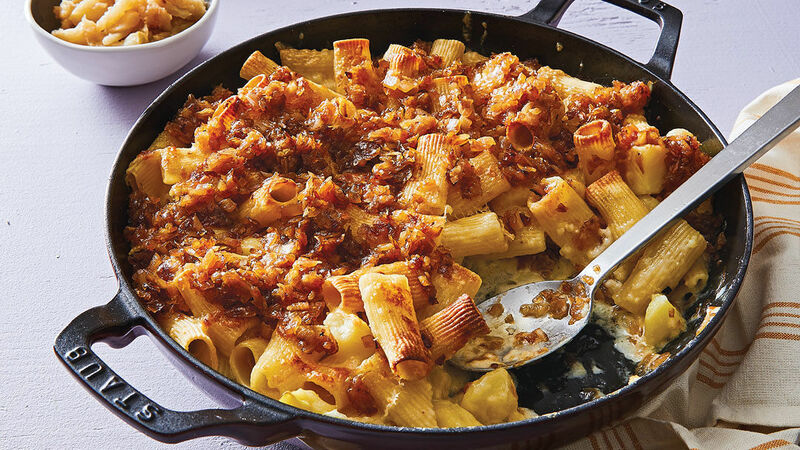 This is truly a Swiss Alpine farmer’s comfort food, a rib-sticking combo of potato, pasta, and cheese served with, of all things, caramelized onions and freshly made applesauce. Don’t even think about using store-bought applesauce; the homemade applesauce makes this dish truly spectacular. In a large skillet, melt the butter over medium-low heat. Add the onions and cook, stirring often, until soft, about 10 minutes. Reduce the heat to low and cook, stirring often, until golden, 15 minutes. Season lightly with salt, and set aside. Position a rack in the center of the oven, and heat the oven to 425°F. Bring a large pot of well-salted water to a boil over high heat. Add the potatoes, and cook until half-done, about 3 minutes. Add the pasta, and cook according to package directions until al dente, at which time the potatoes should be soft, too. Drain well. remaining cheese. Pour the cream over the cheese, and bake until the cheese melts and the dish is bubbling, about 20 minutes. Meanwhile, prepare the applesauce. In a large skillet, melt the butter over medium heat. Add the apples and cook, stirring often, for 2 minutes. Sprinkle the sugar over the apples, and reduce the heat to medium low. Add the apple juice, and cook gently until all the liquid is absorbed, about 15 minutes. Mash the apples slightly with a fork, or leave whole. Keep warm. Remove the casserole from the oven, and spoon the onions over the top. Serve with the applesauce on the side. Easy to make.Great twist and very flavorful with the apple sauce. Loved it and will make it again and again! I've made this once and it was great. Making it again for my granddaughter who is vegetarian. Didn't think the applesauce quite paired, but it was nice for a change.